Senior point guard Meghan Creighton scored her 1,000th career point and picked up several other milestones during Drexel University women’s basketball’s 76-51 home victory over University of North Carolina at Wilmington Feb. 12 at the Daskalakis Athletic Center. Creighton made 10 three-point shots, which set a new Drexel program record, tied a Colonial Athletic Association record and matched a high mark in NCAA Division I women’s basketball this season. She finished the game with a career high 30 points and was named the CAA player of the week for the second time this season. By reaching 1,000 points, Creighton became just the third player in CAA history to amass 1,000 points, 500 assists and 400 rebounds. She also became the Dragons’ all time leader in games played, making her 133rd career start. “I think individual awards are great at the end of the season. This is something I’ll look back on and it’ll be something I achieved forever, but, to be honest, right now I’m not worried about it. I’m happy we got the win, and yeah it looks good on paper and it’ll look good in the record books forever. And it’ll remind my brothers that I’m the best athlete in the family,” Creighton said Feb. 12. Entering Drexel’s game against the Seahawks, Creighton needed just 13 points to join the heralded 1,000 point club. It was a total she had no problem reaching as she connected on five of eight three-point shot attempts in the first half. Her fifth three, which came at the 2:46 mark in the second quarter, was the shot that put her over 1,000. On the season, Creighton is shooting 49.0 percent from long range, which is the third highest percentage from distance in the NCAA. “We talk so much about Meghan’s game and what she can bring to the table, but she’s a great shooter and she’s really bought into a new role this year of taking shots. 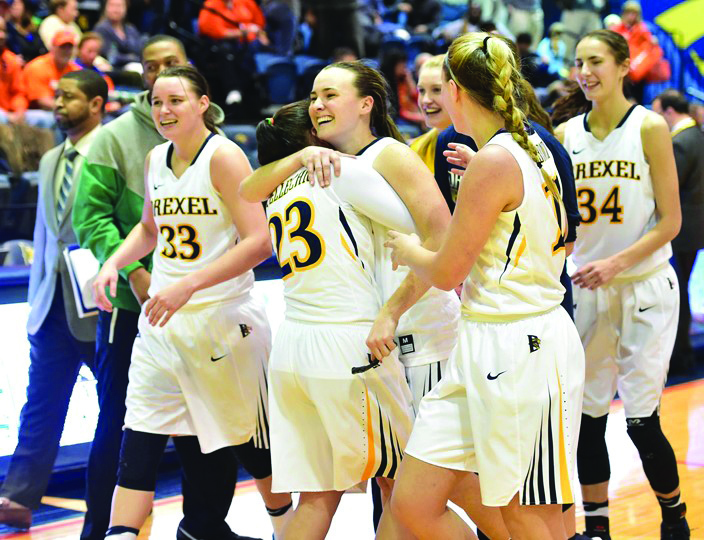 And obviously knowing when she’s making shots, it opens the game up for us, it opens the floor up,” Drexel head coach Denise Dillon said Feb. 12. Though it was not mentioned the moment it occurred, the PA announcer informed the crowd at the DAC of Creighton’s accomplishment when the Dragons returned to the court at the beginning of the second half. While receiving a standing ovation, Creighton gave a shy wave to the crowd as her teammates and coaches cheered her on. “I did know I got 1,000 at that point, but my worst nightmare is that happening. Me getting announced that it happened,” Creighton said. While Creighton shied away from the attention she received for her accomplishment, she did not shy away from the three-point line. The second half became a heat check for Creighton, who knocked down five more three-pointers on six more attempts. If it wasn’t already clear that she was in the zone, Creighton proved it in the fourth quarter. She made a triple on three consecutive Drexel possessions in the fourth, with each of them coming from further and further behind the arc. “I shot the ball like I’d shoot the ball any other day, they just happened to be going in. Did I take more than I would have taken on a day where I wasn’t making them? Yeah, I won’t lie about that. Denise always says when you shoot the ball you have to think it’s going in, so, every shot I take I think is going in,” Creighton said. Her remarkable shooting throughout the contest allowed the Dragons to put the nail in the Seahawks proverbial coffin long before the sound of the final buzzer. “I was really pleased with Meghan’s game today against the zone. She found the open spot in the corner and took those shots, and again it forced UNCW [to think] should we play zone, should we play man,” coach Dillon said. Freshman Bailey Greenberg was also impressive, scoring 11 points on five of six shooting from the floor. For her effort against UNCW, and for the eight points she scored against the College of William & Mary Feb. 10, Greenberg was named the CAA rookie of the week for the third time this season. Nine of Greenberg’s points came in the first quarter, a period in which the Dragons outscored the Seahawks 26-10. After taking command of the game in the first quarter, the Dragons essentially cruised the rest of the way to a victory. Drexel did, however, have a break down on defense in the third quarter. “The third quarter was a little slow, but they really picked it up in the fourth, especially on the defensive end. Our goal was 50, give up 50. It was 51, but it was, I heard Kelsi Lidge say, heading into the fourth, she was like, ‘four points’, and I was like, ‘oh my god’. But we only gave up five in the fourth, so that was good. They’re listening to each other and they’re aware,” coach Dillon said. With their win against the Seahawks, the Dragons improved to 9-4 in the CAA, which has them ranked in third place behind Elon University and James Madison University, who are tied for first at 11-2. Drexel will go on the road to Maryland Feb. 17 to take on Towson University at 7 p.m. and will then return to the DAC for a home game against the University of Delaware Feb. 19.